The species is confined to the Caucasus and Transcaucasia to Northern Iran. In Armenia, the subspecies P.d. zangezura Nekrutenko, 1989 is found in only two spots of Zangezur and Vayots Dzor mountains, where it inhabits high-mountain grasslands, occurring at the stony slopes between 2500 and 3200 m a.s.l. It is known that the butterfly lays down its eggs on Graminaea, however the specific host plant has not yet been identified. The butterflies give one generation per year, being on wing during the late July to late August. Although in some years the species slightly raises its density, becoming slightly uncommon, but mostly it could be considered as rare within its typical habitat. Irregular counts of the species and the strong fluctuations of its density do not provide enough data for computation of the population trend. Although it is assumed that there are no human induced threats for the species, it can be influenced by climate change, being habitat specialist of high mountains. The species is not included in the Global and European Red Lists, as well as not evaluated for the Red Book of Animals of Armenia, and is not included in CITES or Bern conventions. Preliminary assessment of its conservation status suggests Data Deficient. 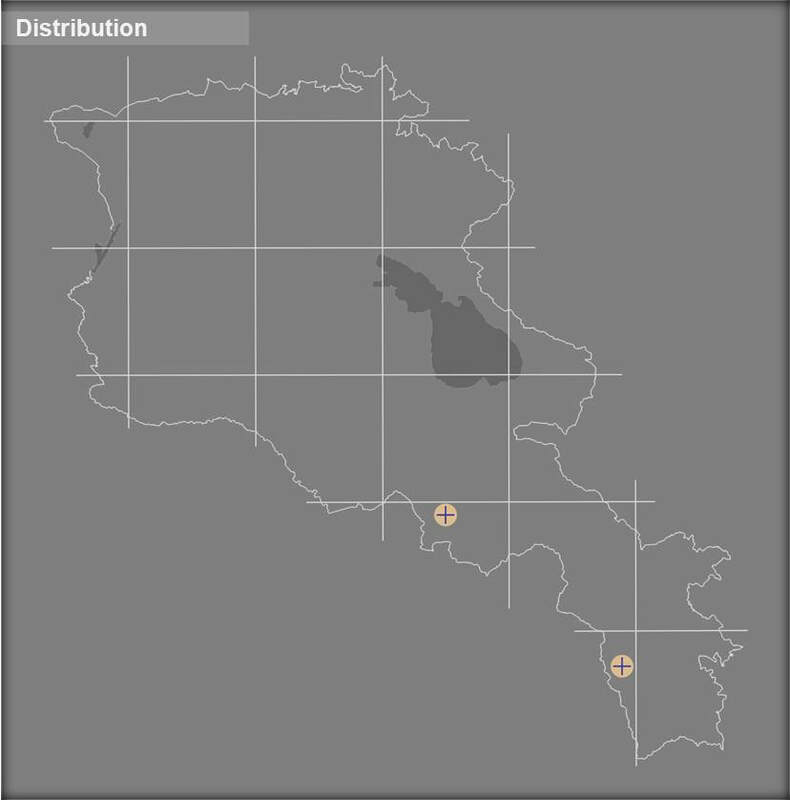 In fact, the both distribution spots are covered by existing protected areas (Zangezur Biosphere Complex and Gnishik Protected Landscape) and Emerald Sites. Moreover, both sites have been assessed as Prime Butterfly Areas Kajaran and Gnisheek. Therefore, at current it is only recommended to implement the study of species' biology and ecology, and setting up of its monitoring scheme, aimed at revealing of the population trend.